For decades scientists have searched for a set of simple, easily measured traits that could be used to predict how plants respond to environmental change at any site around the world. These traits have been referred to as the ‘holy grail’, because they could serve as a standardized instrument, a biological barometer, to predict the effects of global change on the earth’s ecosystems. In this study, we measured how some of these commonly used leaf traits respond to two of the most prevalent global changes, increased nutrient loading and altered grazing rates, across a set of 27 grasslands sites on four continents. These sites are part of a globally replicated experiment, the Nutrient Network (http://www.nutnet.umn.edu/), being conducted at over 100 sites around the world. Scanned images that illustrate the diversity of leaves sampled in this study from 27 grassland sites. 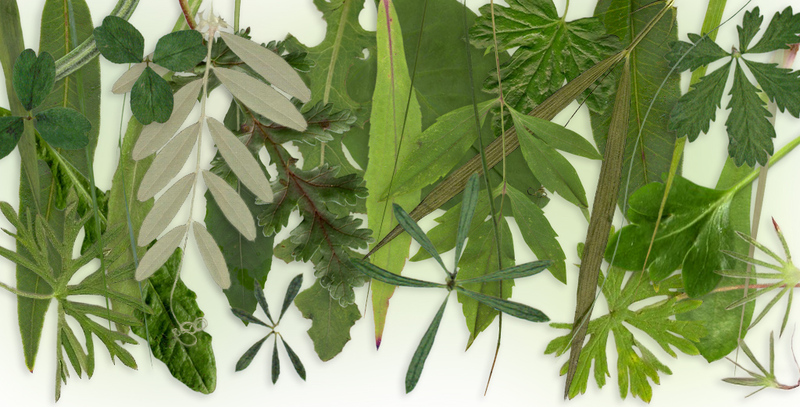 These very leaves were collected from sites located in Australia, Canada, United Kingdom, United States and Switzerland and brought together in this collage. We found that leaf nutrient concentrations (i.e. percent nitrogen phosphorus and potassium) increased in fertilized plots, which is consistent with ecological theory (Wright et al. 2004, Funk et al. 2017). However, this result is at odds with a well-known theory in agriculture called the growth-dilution effect (Jarrell and Beverly 1981), which predicts the increased growth of the plants will outpace nutrient accumulation in the tissue. Contrary to existing ecological theory and expectations from physiological ecology, specific leaf area (SLA), perhaps the most widely-used leaf trait, did not show a consistent response to nutrient addition. We found little consistency in how leaf traits changed in response to altered grazing pressure, which is contrary to expectations from plant-defense theory. Why are leaf traits so important to plant ecologists? The environment in which plants grow and the organisms that eat them can sculpt their features or ‘traits’ including the area, weight, and thickness of their leaves, the number of seeds they produce, the height they reach, and the amount and type of roots they grow (Diaz et al. 2015). These traits, in turn, can determine the effectiveness of each species – and the combination of species in a location – in capturing energy from the sun or nutrients from the soil. Ecologists use changes in leaf traits to compare plant growth strategies and subsequently infer how ecosystems function (Funk et al. 2017). Over 390,000 vascular plant species are identified with approximately 2000 new vascular plant species discovered yearly, so finding generalizable trends across different plant communities could be made easier if plant species ecological roles could be characterized by a set of easily measured traits. Despite the high diversity of species globally, it is reasonable to expect that there may be consistent trait responses, because all plants have much in common including their reliance on three essential resources, light, water and elemental nutrients, which sustain common functions of growth, reproduction, defense, and storage. Plant ecologists use traits to discover commonalities, but leaf traits are also used more practically to understand the impacts of disturbance and for rebuilding plant communities in restoration efforts. The practical application of leaf traits to infer ‘function’ has been ongoing for decades (Chapin III 1980) without a global experimental test of whether leaf traits actually respond in a predictable way to short-term perturbations. The leaf economic spectrum (Wright et al. 2004), arguably one of the most influential publications in plant ecology provided the impetus for this widespread study of leaf traits. Using observed global patterns of leaf traits, the leaf economic spectrum found clear patterns of trait correlations, including SLA and leaf nutrient contents, depending on the productivity of ecosystems ranging from the arctic tundra to tropical forests, from hot to cold deserts and from boreal forests to grasslands. For example, they found that leaf traits correlate with productivity, identified a continuum of fast growing resource acquisition specialists through to slow-growing conservation specialists, and used traits to test macro-evolutionary processes. Plant ecologists have reverse engineered the biogeographical-scale patterns of the leaf economic spectrum to infer a functional response of plant communities at the local-scale to perturbations even in the short-term (Firn et al. 2012). This wide-scale adoption of plant leaf traits as a barometer of function is in some ways akin to evolutionary biology’s adaptationist programme, which was criticized in the 1970s for assuming that changes in an organism’s phenotypic traits have functional or fitness significance (Gould and Lewontin 1979). In ecology, it has remained unclear how ‘functional’ plant traits really are as predictors of ecosystem response. Our experimental test helps to isolate cause from correlation in the relationship between plant function and plant traits. Leaf nutrient concentrations are useful as barometers of short-term nutrient enrichment, but not SLA. SLA still has its uses, a measure commonly used to distinguish plant defense-competition tradeoffs. It might be that SLA is less plastic and thus a complete species replacement is needed over the longer term in response to the treatments to detect a change. In this global network of sites, some grasslands experienced replacement of the dominant species while others, were dominated by the same species even after up to four years of treatment applications. Community and ecosystem studies are relying more and more on databases (Kattge et al. 2011) to source plant traits, particularly studies where a species is defined by one or just a few trait values. Our results provide some evidence that database values for SLA may be relevant at the species-level, beyond the environment in which the measurements were taken (although we did not specifically measure intraspecific variability in this study), but indicates that leaf nutrients concentrations are determined by environment but not by vertebrate herbivores.